if you like sweeter add sugar, you can use pumpkin instead of sweet potato. (1)Peel Japanese sweet potatoes and cut into small chunks. Boil until soft. Drain and mash while still hot. (2）Add butter and milk to the mashed potetoes and mix well. 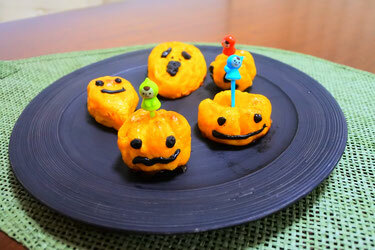 (3)Form the mashed potatoes into ghosts and pumpkims. Make pumpkin lines with a chopstick or something stick. (4)Brush the ghosts and pumpkins with egg wash.
(5)Bake in the oven or toaster oven until the topis brown. (6)When it cools down, decolate with chocolate on top.